Momoko has a lover from outer space, and dressed “techno pop” for him. I like her. Not the “I totally want her, now!” kind of like. But I really like that she is original and has a lot of personnality. 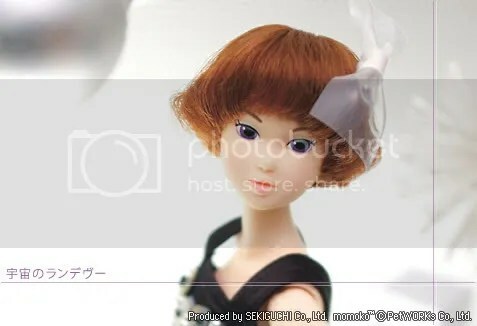 She doesn’t look like any previously released Momoko, and I really like that. I think her clothes might be popular. She has a strong retro look. Not what I prefer, but it’s nice. It certainly looks great on her. I also like that she’s got the new T-strap pumps. They look nice in that black&white design. Things I like best from her stock outfit: the tights (purple tights!) and her clear bracelet. I really hope she will get a positive welcome, because as I said I really like the fact that she stands out. She’s a really nice concept. And isn’t she pretty on the picture above?